Bow Hunting in Texas - Is Everything Really Bigger in Texas! When it comes to bow hunting, Texas has the normal rules and regulations. 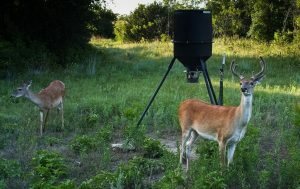 Everything is plain and simple to help you if you are planning on bow hunting in Texas, it’s a great choice! Crossbows are not lawful for taking migratory game bow hunting in Texas. Only the specified archery are legal. These items may be used during any general open season. Bows and crossbows may not be used to hunt deer in muzzle load season. Only those licensed to carry a concealed handgun in Texas may carry one. Firearms are allowed in camp if they are in your vehicle, or you are hunting any lawful game besides whitetail deer, mule deer and turkey. Bows and crossbows are legal for hunting non-game animals that are not protected. If you are using longbows, recurves, or compound bows there are several regulations you should be aware of for bow hunting in Texas. Bows must have minimum 40 pound draw for all game besides squirrel. Bows with full or partial draw locks are legal during any lawful bow hunting season. Crossbows and crossbows with telescopic sights may be used to hunt game animals and game birds, with the exception of migratory game birds, during open seasons and Eastern spring turkey season. Persons with upper-limb disabilities may use a crossbow to hunt deer and turkey during the Archery Only Open Season, provided the person, while hunting, has in their immediate possession a physician’s statement certifying the extent of the disability. Anyone with a doctor’s certification of an upper-limb disability such as the loss of, or loss of use of fingers, hands, or arm which makes in impossible for a person to use regulation archery equipment, may use a crossbow. A crossbow is lawful for game animals and game birds (except migratory game birds), as long as the crossbow has at least a 125 pounds of pull, a mechanical safety, and a stock no shorter than 25 inches. No poisoned, drugged or explosive arrows or bolts may ever be used. When hunting turkey, and all game besides squirrels, a projectile must be equipped with a broadhead hunting point that is at least 7/8″ wide upon impact, with at least two cutting edges. A mechanical broadhead should open upon impact and be at least of 7/8″ wide. An archer may have arrows or crossbow bolts with field, target, or judo points with broadhead hunting points in the quiver.